I just received an official-looking “survey” from the Democratic Congressional Campaign Committee, called The New Directions Survey. Its ostensible purpose is to canvass the party faithful about what agenda the newly elected Democratic majority in Congress should pursue. I would be surprised if the results from this survey are ever tabulated, and if they were, more surprised if they ever figured into any congressional policy agenda. The real purposes of the survey are, first and foremost, fund-raising, and secondarily, to energize the reader to support congressional political action. It is a thus a solicitation and a directive, masquerading as a substantive dialog. I’m sure the Republicans are up to the same tricks but I never see that side. Predictably, the very first item concerns how much money you are prepared to donate to the congressional Democrats. The $35 check box is asterisked and noted, “Gifts at this level are urgently needed!” as if there were something special about a $35 contribution that a $50 gift could not satisfy. And what would your contribution actually be used for? 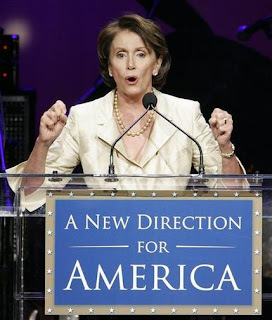 “To help Democrats move our nation in a positive new direction and strengthen our majority in the U.S. House of Representatives.” Are those the same thing? The statement implies that they are. Please rank the following Democratic priorities in the order of importance. What I like about the choices is their diabolical ambiguity. “Energy independence” from what or whom? Exxon-Mobil? Foreign oil, but not domestic oil? All fossil fuels? Do we want a ramp-up in nuclear power? Drilling in Alaska? Any policy could be justified with this choice. “Expanding access” to “affordable” health care. The suggestion is not to provide health care to all Americans but only to “expand access.” Why if only three people purchase health insurance next year, we can say that access has expanded. As to “affordable,” that rather depends on one’s income, doesn’t it? What’s affordable to you may not be to me. It’s a weasel word of the highest order. “Setting a new course in Iraq.” Actually, my priority is to end the war in Iraq, but that is not a choice the congressional Democrats are prepared to contemplate. Instead, they prefer change for the sake of change. How courageous. Guaranteeing retirement security for America’s seniors. It comes as a surprise that it is in fact “America’s seniors” who are retiring. Who knew? The awkward phrasing is designed to call out “You-- yes, we’re talking about you, boomers!” What security do congressional Democrats have in mind? I would guess security means at least ability to pay for housing, food, clothes, medical care, and transportation. Could that be “guaranteed” for everyone who retires? Only in a dream. But by imagining it is possible, you might be induced to support congressional tinkering with Social Security. Taking swift action to stop global warming. Who could be against stopping global warming? Except oops, they don’t promise that. They only promise to take swift (ill-considered, extravagantly expensive, ultimately ineffective?) action. Gutsy. Protecting our nation from the threat of terrorism. What we would like is protection from terrorism, not the threat of terrorism. The threat is anxiety provoking, to be sure, but on a list of priorities, one would hope that protection from terrorism would be high on the Democratic list. But it isn’t. Is there a “Republican culture of corruption in congress?” The question says there is, so there must be. What is a culture of corruption? An alliterative slogan. Is it important? The question says it is, so it must be. The only choice is how important it really is. “Not at all” is not a response you may choose. Should every American be guaranteed access to quality health care? (Yes, No, Not sure.). Would anyone answer “No” to that question? Again, note that only “access” is contemplated, not health care itself. But they should have also asked if every American should be guaranteed a $50,000 a year income. (And a new car every year too.) You know, just to see what people think! Needless to say, I did not fill out the survey or send in money. I would think that this cynical so-called “survey” would be self-defeating. It is a condescending, slap-in-the-face insult to anyone who can think. But that’s the tragedy.